If you’re a Youtube or Instagram makeup junkie, chances are you’ve seen tons of influencers flaunting cut crease eyeshadow. It’s made a name for itself as a go-to makeup technique to make your eyes look bigger and stand out in a flawless way. If you’re wondering how to work your eyeshadow crease magic and master this technique, take a look at our favourite products and tutorials! Cut crease eyeshadow is a genius technique used to define your eye crease. It’s done by “cutting” across your crease with contrasting eyeshadow colour and little to no blending. Cut crease eye makeup is used to lift your eyes, making them look brighter and more open, especially if you have a medium or heavy fold! It defines your eye socket in a dramatic way, leaving you with stunning eyes. It’s also quite simple to do! First choose a lighter shade of eyeshadow to apply all over your lid, then add a darker shade on top of your lid crease. We’ve listed our favourite cut crease makeup products a little farther below so you can see what palettes we recommend to get this stylish look. 1. Apply Primer: Make sure to apply primer all over your entire eyelid. If your eyeshadows blend into each other, the cut crease look won’t work, so add prime to ensure shade stays in place. 2. Choose Your Light Eyeshadow: As I mentioned above, start out by applying a light eyeshadow shade all over your lid, up to your brow. This will highlight the whole area, helping your eyes brighten up. 3. Time for Eyeliner: Use a dark eyeliner to create a V-shape starting from the crease in the middle of your eye, connecting it to the outer corner of your eye. 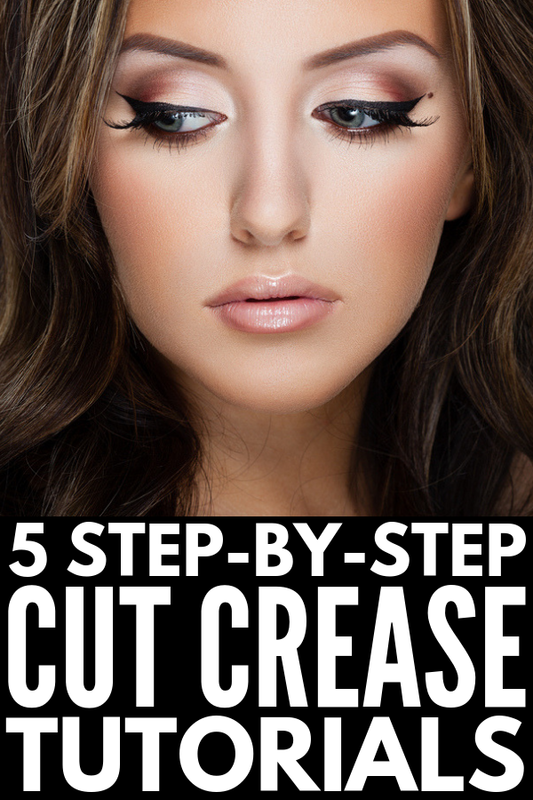 Use less pressure in the middle of your lid and go thicker toward the outer corner. 4. Blend It: Use an eyeshadow brush to blend the line you just drew outwards to the outer corner of your eye. 5. Dark Shadow: Apply the dark eyeshadow shade over the top line of your eyeshadow and slightly blend above it. 6. Line It: Line your lash line with your favourite liquid eyeliner to add definition. Start from the inner corner of your eyes and draw a line that wings outwards. 7. Finish It Off: Use the dark eyeshadow you used above your cut crease along your bottom lash line to finish off the look. This palette has all the shades you’ll need to create a gorgeous cut crease look, plus it’s incredibly affordable. It comes with 18 super pigmented hues, some are shimmer, some are matte, some are basic and some are bold so you can get any look you want! The last thing you want for your cut crease look is for the lighter and darker shades to blend and crease. Use this gentle, easy-glide primer to make sure everything stays in place. A good eyeliner is key to a perfect cut crease makeup look, and a liquid liner works best for this technique. This formula won’t smudge, smear or fade so your look will last all day. Stocked with 3 reusable pairs of handmade false eyelashes, these falsies will help pull your look together. Made with thin fiber material, they’re hypoallergenic and won’t harm your eyes! Apply them after you’ve created your cut crease look to finish it off with an extra touch of glam! In this tutorial, she uses the Anastasia Beverly Hills Soft Glam palette to create a gorgeous cut crease eye makeup look. She uses colours like ‘Sienna’ and ‘Rose Gold’ for a glam look that’s not over the top. She also uses the Benefit Cosmetics Bad Gal mascara for her lashes as well as the MAC Paint Pot in Soft Ochre. Using a variety of brushes and eyeshadow shades, watch how she creates a perfect cut crease look. She uses shades from the BH Cosmetics Take Me Back to Brazil palette as well as the Morphe 35W palette. And don’t forget a pair of false lashes to bring the look together – just look how it makes the cut crease eyeshadow even more perfect! I love this simple cut crease tutorial, and what makes me love it even more is the addition of glitter! It gives the look an unexpected shimmer and makes your eyes look even brighter! She uses the Urban Decay Perversion liner to define her wing and the Tarte Tartlette In Bloom palette for her eyeshadow shades. For a pretty, neutral cut crease look, this is the perfect tutorial! The end result is gorgeous, but not too in-your-face, it’s perfect for a day to day look! She uses Anastasia Beverly Hills eyeshadow shades like Touch of Lilac as well as the Kat Von D ink liner in Trooper. This makeup look is so warm and perfect for the holiday season! With a touch of glitter and warm red hues, it’s the only look you’ll need. She uses products such as the Morphe gel liner and the Kylie Cosmetics So Cute lipgloss to compliment the cut crease look. Ready to nail the cut crease eye makeup technique? Use these tips and products to get the gorgeous look! Love this post on cut crease eyeshadow? Make sure to share it on Pinterest! Looking for more makeup tips and tricks? Be sure to follow our Beauty Board on Pinterest!